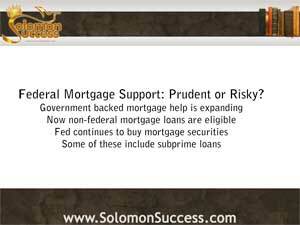 Solomon Success > Blog > The Fed’s Refinancing Initiative: A Prudent Investment? One of the cornerstones of Christian investing is prudence, a virtue advocated by King Solomon in many of his Proverbs. As the King says, prudence goes hand in hand with knowledge to lay the groundwork for wisdom. In current times, those three qualities still govern successful investing in income property. Recent moves by the Federal Reserve and other government backed programs to jump start the housing markets might benefit from a dose of prudence, as the subprime mortgage problem that contributed to toe housing collapse of 2008 may resurface in 2013 in these Federal-backed recovery efforts. Current refinancing programs such as Home Affordable Modification Program (HAMP) or the Home Affordable Refinance Program, (HARP), are available only to mortgage holders whose loans are owned by the government-supported mortgage agencies Fannie Mae and Freddie Mac, even if those loans are serviced by another lender. Other eligibility rules also apply – for example, loan payments have to be current. About half of all home loans are owned or insured by Freddie Mac or Fannie Mae, either directly or through numerous loan servicers such as banks and other kinds of financial institutions. But those holding mortgages that originated from other lenders could not qualify for assistance under the current parameters of the programs. Now, a major change in the structure of the HARM/HARP program and others like it allows mortgage holders with loans originating with other lenders besides Fannie Mae and Freddie Mac to qualify for refinancing under the terms of the programs. But a number of those outside accounts involve subprime loans, riskier arrangements of the kind that accounted in large part for the housing collapse of 2008. These have originated with a number of subprime lenders, and many of them have been bundled into securities packages. Some of these have been bought by Fannie Mae and Freddie Mac in the Fed’s ambitious program to buy up billions of mortgage backed securities every month in an effort to jump-start the housing recovery. That puts large numbers of risky loans in the hands of the very agencies aiming to stabilize the housing market and keep struggling property owners afloat. And, while many financial and real estate experts welcome the expanded eligibility for federal mortgage help, others worry about the effect of those subprime loans on the stability of Freddie and Fannie. In fact, in order to allow those federal mortgage loan companies to change higher interest rates on those riskier mortgages, their charters must be amended. This would allow these agencies the right to charge higher rates to customers across the board, and to take other steps to minimize the potential risk involved in this kind of loan. Other variations of these plans have also been floated by lawmakers on both ends of the political spectrum. But in all its forms, refinancing assistance for eligible loans is available to holders not just of residential mortgages, but also of income properties – making it possible to keep those properties financed as Jason Hartman recommends. Mortgage Backed Securities: Boosting the Recovery?